Every time I go grocery shopping I tend to pick up a bunch of bananas. We eat them with plenty of gusto when I first bring them home but it never fails, we always seem to leave a few. Those few bananas tend to just sit there. Feeling unloved and neglected. They get passed over for something else more appealing. Each day they get a little more sad and dark. Admit it, you would walk right on by them too! But that is when they are in their sweet spot. Literally, the more they ripen, the more sugar is released and the sweeter they get. Making this the perfect time to put them to good use. My mind always goes to baking up something good when I notice they need some love. 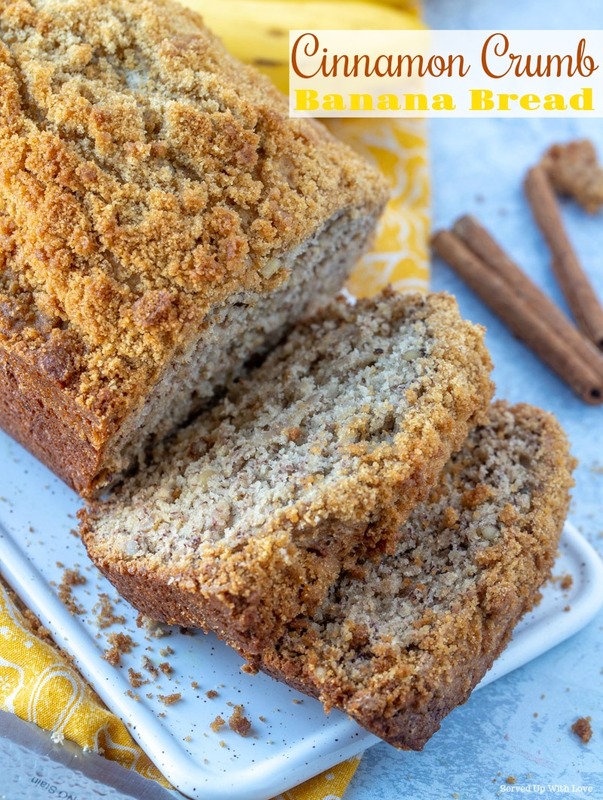 Banana Crumb Muffins, cakes, breads, Frosted Banana Bars, the list could go on. But I also like to slice them up and flash freeze them for Sunshine Smoothies and Skinny Strawberry Ice Cream. Wouldn't you know it, as I am typing this up, there are some waiting on me on the counter. Time to get to baking! 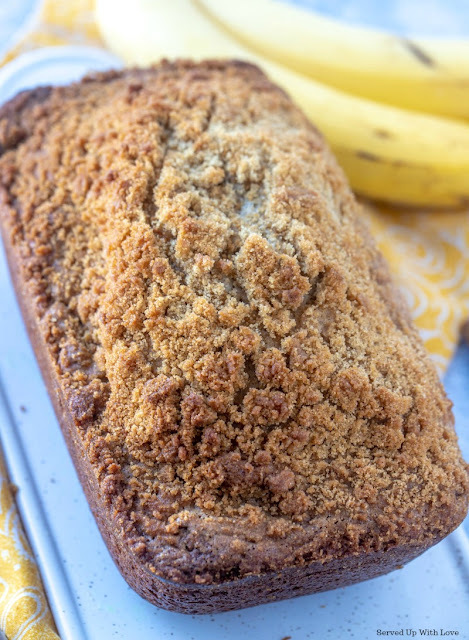 This Cinnamon Crumb Banana Bread is packed with so much flavor. The crumb topping just gives it just a little something to bring it over the top. 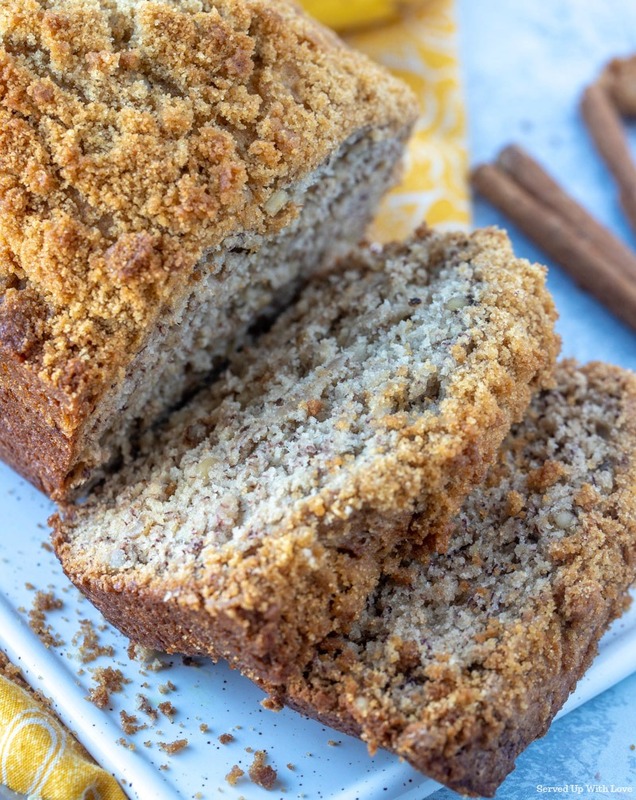 The walnuts give it just a little nuttiness but is not necessary if you are nut free. Just leave them out and it will still be just as delicious. 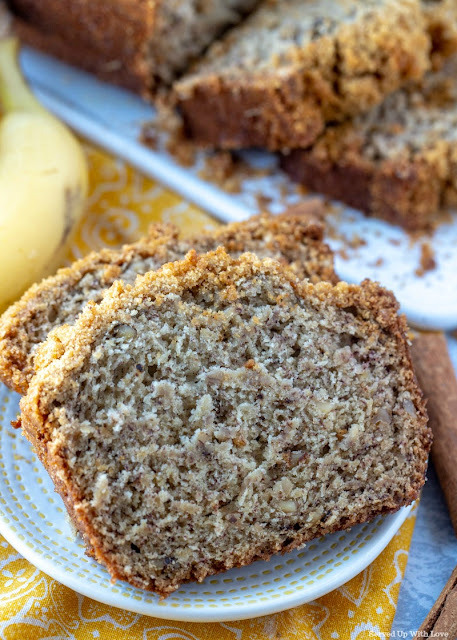 Slathered with a little softened butter and drizzled with a little honey makes this bread the perfect breakfast to go along with that morning cup of joe. 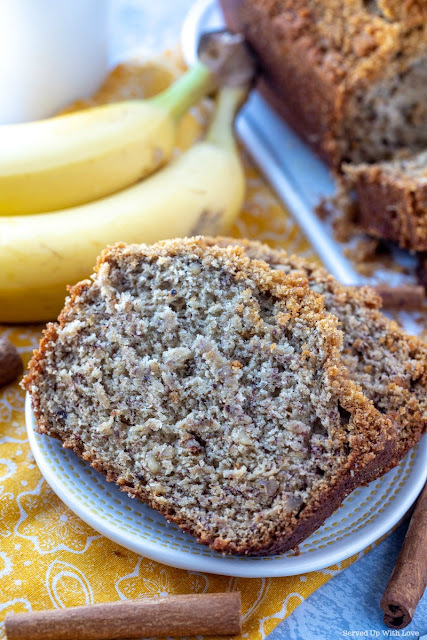 An easy recipe to use up those bananas needing some extra love. The cinnamon crumb topping brings it over the top. Cream shortening and sugar. Add eggs, bananas, and dry ingredients. Pour into greased loaf pan. In a small bowl, mix together brown sugar, 2 tablespoons flour and cinnamon. Cut in 1 tablespoon butter until mixture resembles coarse cornmeal. Sprinkle all over the top of the bread. Bake for about an hour at 350 degrees.